The high quality Lifespan C3i upright bike is big on mechanical specifications and doesn’t bother with cheap gadgets on the console. You get more bike for the money than competitor models at this price. The Lifespan C3i upright bike has a blue backlit LCD display showing readouts for time, speed, distance traveled, calories burned, heart rate, watts, resistance level, time and RPMs. The console features a user-friendly Intelli-Key™ lighting system that automatically lights up each key to press to start a new workout session. UPDATE: The C3i upright has been discontinued and replaced with the all new LifeSpan C5i. It features twice as many built in workout programs, a more extensive warranty and some additional upgrades for the new year. Check out the improved model now, a great choice in the under $1000 price category. The Lifespan C3i features oversized steel tubing, an 11" diameter 24-lb balanced flywheel, oversized magnet carrier, three-piece steel crank set, upgraded sealed bearings, reinforced Poly-V belt, self-balancing pedals with adjustable straps, and 16 levels of automatic push button resistance. The Lifespan C3i has a seat to pedal range adjustment of 27.5 inches to 40.5 inches. Other features of this upright bike include a variety of exercise programs, a 350-lb max user weight capacity, PVC dipped handlebars with elbow pads, and an integrated universal heart rate receiver (chest strap not included). The programs help you improve your cardiovascular fitness as well as lose weight. Workouts include Interval, Mountain, Random, Weight Loss, Target Heart Rate and Manual. The console tilts at different angles for best viewing, and it features a spring-loaded, pullout rack for holding a book or magazine. The Lifespan C3i is simple but complete. It features quality components in the flywheel and brake system, and a full array of challenging programs, without adding unnecessary entertainment plug-ins, speakers, or fans. 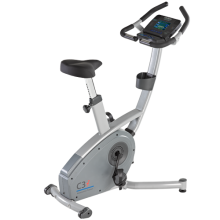 This LifeSpan C3i upright bike is an excellent choice in the category, and competes well with similar offerings from Horizon, NordicTrack and ProForm. Although it lags in some departments, such as advanced technology, it makes up for any shortcomings with solid design, a strong warranty and its high max user weight capacity. Definitely consider LifeSpan if you are in the market for an affordable home exercise bike.